It’s a miserable day outside today. It isn’t even November yet, but yesterday it snowed, and today it is cold, grey, wet and windy. We last got a fill of oil in Spring, but the light on the gauge is flashing, which means we are down to the last bit, and it’s nearly time to order again. One of the great imponderables for a retiree is the future cost of heating oil. Is it going to get so expensive that it becomes a luxury rather than a necessity? But now I’m starting to wonder just how much a necessity it is? If we had to do without it, life would be damned uncomfortable, but would it be fatal? Fifty years ago when I was growing up, central heating was something you would find in school, or some other institution. It usually consisted of massive four inch iron pipes running around the skirting to huge radiators. Out the back, you’d find the boiler house, which was coal fired. Domestic central heating was unheard of. Our house was a fairly ordinary house. It had fireplaces in each room, but the upstairs ones were never lit. Heating consisted of a coal fire in the sitting room and a small cast iron range in the kitchen. For spot heating we had an old portable paraffin stove that was dragged out if someone was confined to bed, or whatever, and a couple of electric heaters whose elements were always burning out. Winter night times were the worst. The bedrooms would be colder than a politician’s heart, and we would wear our socks to bed. There were plenty of hot water bottles and if the worst came to the worst, I used to rob my father’s overcoat to throw over the bed. Frequently in the mornings, ice would have formed inside the windows. Double glazing was another invention of the future. We put up with it and made sure all doors were closed at all times. It was uncomfortable all right, but as there was no alternative, we didn’t complain. We were also a hell of a lot tougher and healthier. I often wonder what would happen if the modern generations had to put up with the life we had? Doubtless there would be endless complaints. They would cry that they can’t possibly live under those primitive conditions. Bloody hell, we had one of those paraffin stoves too. Bringing back a few memories now. It must still be around here somewhere. I might go and look for it later as it’s a bit cold now. Grandad, your turning into a right grumpy old man aren’t you? It’s a bit chilly but it could be worse. You should rename this from head rambles to rants of a grouch. I’m not going to lecture you about smoking (I know better than that), but I’m afraid cold feet are a consequence of that habit. So perhaps what you need for those cold tootsies is a pair of these. Nobody here believes me when I tell them this, but as a kid growing up (in the early 1970s), our house was pretty damp. Single glazed windows, no central heating – pretty much the same as Grandad’s house. There were 3 of us in the one bedroom, and in the winter time, not only was there ice on the inside of the windows, but also the blankets would be frozen to the wall with a nice layer of ice from floor to ceiling. Being warm is so much nicer than cold and damp. You have just described my childhood home to a ‘T’ – we used to gather round the fire to get as warm as we could then leg it up the stairs with out hot water bottles and even then it took ages to get warm enough to go to sleep. I used to get shouted at for drawing in the ice on the inside of our window panes. And the curtains used to stck to the ice too!! I first had central heating only six years ago when I moved to the bungalow and still I use a calor gas fire for the worst of the weather. If this is Autumn then we will be running up huge bills come the winter. I didn’t have central heating until I left home (is it really six years you’ve been in the new house Kate? ), I remember arguing over who would go out to fetch fuel for the fire…. Nobody wanted to to do it – Ten Minutes out in the snow – No way…. The alternative.. No hot water for a bath!? Althought the -4 that my car read at 7am yesterday morning did make me use a few choice words still! I invested in a wood burning stove once the pricks in Bord Gais started getting greedy. Still use the gas to heat the water, but unless it gets very cold I use the stove which heats the front room and the kids room above it. €200 worth of wood should see me through the winter very nicely. Might get a back boiler for it next year, I specifically chose a model that allowed one to be retrofitted. @ Thriftcriminal – my partner has just had a wood burning stove put in – I don’t think he’s had to buy any wood for it yet – he just chops up all the stuff he’s offered and puts it all in his log store. It really heats the ground floor of his house! Yeah, the first year I had it I survived the winter with big chunks of Eucalyptus from my friends mother’s garden, she got the tree cut down and didn’t have a fire to burn it in, so I took it off her hands. Chopping wood is great, one of my favourite forms of exercise. Phase 2 will involve getting a spot of land and planting some fast growing trees, with the help of a gubmint grant, heh. Robert – Many’s the pot of tea our stove kept warm. 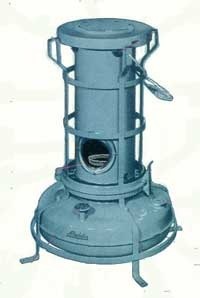 Whenever I smell burning paraffin I always think of that heater. TheChrisD – Yup. We had a wee blizzard at one stage with huge flakes. It didn’t lie for long though. Karyn – I am very thin and am over six foot. The poor old blood gets thin by the time it travels that far. AM – Now that you mention it, our curtains used to freeze to the windows. Ah! The Good Old Days!! What I remember about pre-central heating childhood days was how healthy we were. Ice on the bedroom windows in the morning but we didn’t catch colds, flu etc. @ Keiron – yes – it’s six and a half really since I bought the house that Jack built – when are you coming up to sort the spaghetti junction in the attic? That’s if you don’t count the 20 million people who died in the 1918 flu pandemic. Bah. They must have been the ones with central heating. TT – I think I may still have ours down it the shed. Then, maybe it was chucked out. I didn’t know they still made them. Are they still branded as Aladdin? Bock – It wasn’t the cold that caused the flu, and you know it. Though I would hazard a guess that if they did have central heating in those days, it could have been a lot worse? I grew up in uninsulated house in northern Pennsylvania that was heated entirely by wood. In the 1970’s you could get a permit from the state to cut up trees that were already down on state land. It took a lot of wood to heat the home through the long winters. As a child I actually slept in the original master bedroom. No on else wanted it as it was the farthest room from the wood stove. At night if left a glass of water on my night stand, it would freeze. Not Aladdin here in US. Gonzales or Hiu- Chin. p.s. Is there much interest in our election over there. Both Irishmen runing. John McCunt and Barry O’Bama. Is it runing or running ? Grandad, you’re right about being healthier; I think the cold killed the germs that today we just keep passing around. The original ‘central heating’ in our house is the massive double-fireplace chimney breast that actually warms the house quite well while it’s going. We grow biomass willow to keep it going. As I remember, going to bed in the cold was never as miserable as getting UP in it. My tears are freezing on my cheeks, just thinking about it. Very true. Getting dressed in the mornings while still IN bed. Touching off the rapidly-freezing “hot” water bottle that you squeezed to death only hours previous always produced a happy shriek in the cold light of morning. Since when was misery a cause for nostalgia? Oh yeah, since Frank McCourt…. Frank McCourt just did a local refinement of miserable nostalgia. Oy Grandad, you’re blog clock is still on summertime. Is that in defiance? I hope so. I had forgotten the joys of getting up! There were two tricks to it – you either smuggled your clothes in under the bedclothes and tried to get dressed there, or else there was a mad dash out of bed to get the clothes on as quickly as possible. As for the nostalgia side of it, I don’t for a moment suggest we should go back to those days. I was merely contrasting what we have now that we take so much for granted, and fifty years ago where we managed to survive without life’s “essentials”. SHoop – You know my attitude to all this rubbish of changing clocks around!! Hi Grandad. You just described the house I’m living in at the moment! Bought my Grannies old house a couple of years ago and still haven’t installed central heating or any double glazing. It does get quite cold but you manage. No real complaints here and I grew up with central heating in my parents house! Us youngsters aren’t all a bunch of moaners! We checked on the price of oil last week and it was 75c a litre. Got a delivery yesterday at 60c a litre so I suppose that’s one teeny silver lining in the huge dark economic cloud. Used to stay at my grannies and her downstairs basement (where the loo was) was heated by a paraffin yoke like that. Sometimes it was so cold, your bum would stick to the seat. Ah…all our yesterdays….